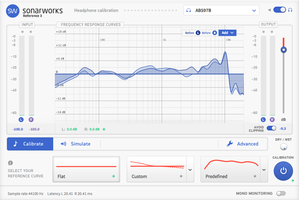 Headphone Calibration, Monitoring calibration software from Sonarworks. Product replaced by the Sonarworks Reference 4 Headphone Edition. You all know what it's like to finish a mix that sounds amazing on your headphones and then try to show it to your grandma on her hi-fi system, only to discover that it sounds terrible. The mix is completely different: It lacks lows on the chorus but has too much on the verse, the vocals can't be heard. In short, it's awful. Granny is about to disown you...Until Sonarworks comes along to save the day. 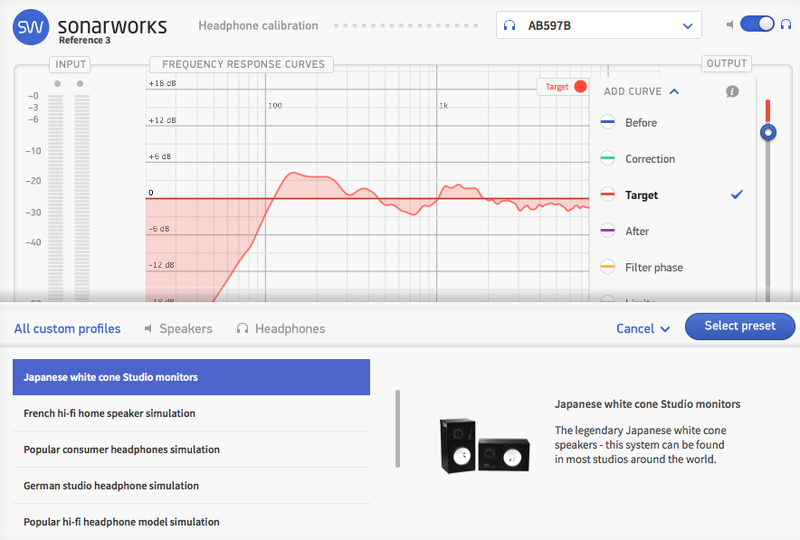 Sonarworks is a very young company that started to make a name for itself in 2014 thanks to a software that allowed you to calibrate your speakers with a measurement microphone and software — similar to IK Multimedia's ARC. But, while the latter uses the Audyssey technology ─ a company specialized in calibration ─ Sonarworks has its own R&D and an algorithm that works with no less than 16,000 correction bands. 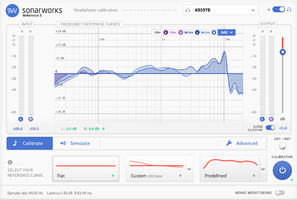 The first problem Sonarworks had to face was the massive amount of different headphones on the market. How can you cater to everybody given the heaps of brands and models available? What's more, two pairs of headphones of the same model can sound totally different. The software maker offers two solutions to this problem. 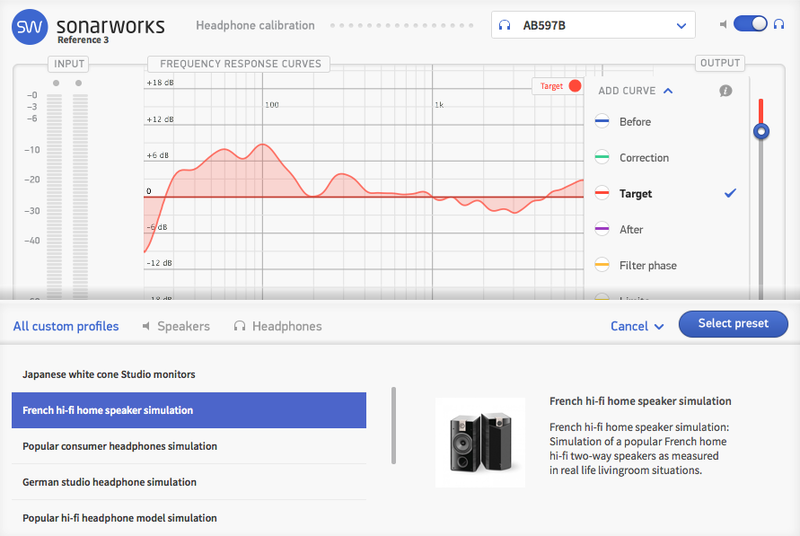 The first one is to offer the software bundled with a pair of headphones (Sony MDR-7506, Superlux HD681 or AKG K 712) they have previously measured in their lab to offer you a more precise and customized calibration. The second solution consists in you sending them your favorite headphone pair directly to Riga, in Latvia, that is, so that they can measure them and send them back to you with a customized calibration file. This individual calibration service costs $88, one-way shipping included (there is currently an offer whereby you get 50% off the regular price). 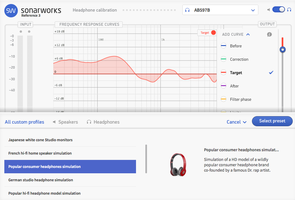 Finally, along with this system, the Sonarworks team regularly buys several copies of the same pair of headphones to measure them and establish an average frequency response. It's yet another solution, maybe less precise and not customized, but much more affordable. 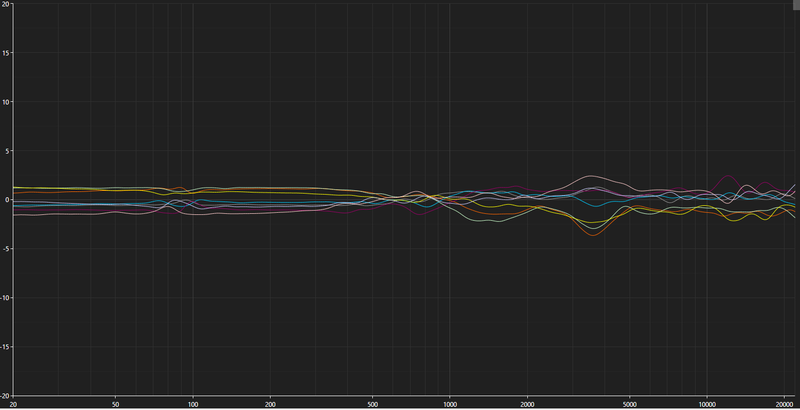 The number of models is limited, but constantly expanding. Among the selected models so far are the Beyerdynamic DT880, DT770 80 Ohms and DT990, Audio-Technica M20x, M40x and M50x, AKG K141 MKII, 240 MKII, K 702, K712 Pro, and K701, Sennheiser HD598, HD280, HD650 and HD600, Sony MDR-7506, Shure SRH840 and Superlux HD681. If your headphones are not on the list, you can always buy the plug-in by itself ($69) and, even if the end result isn't perfect, it will be entirely satisfying. 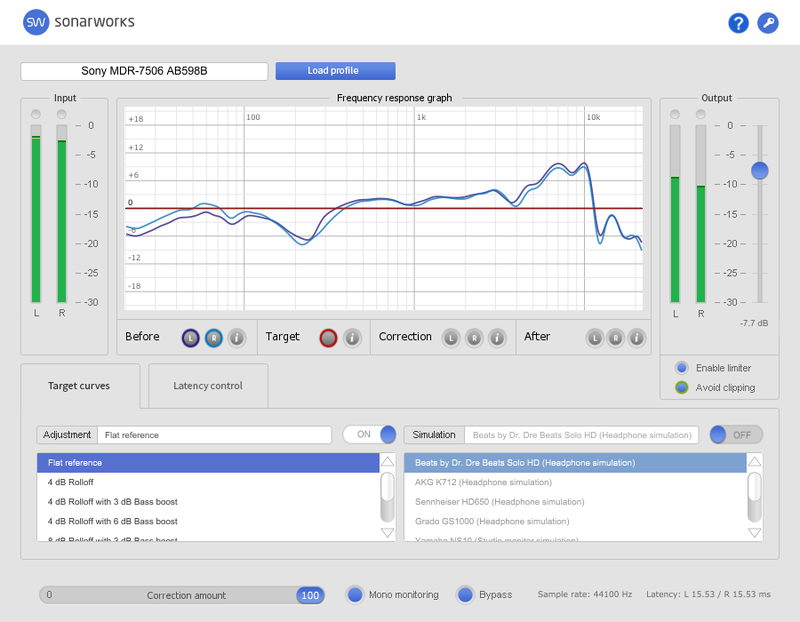 To make this review, the software maker sent us the plug-in and a pair of Sony MDR-7506 measured in their headquarters. 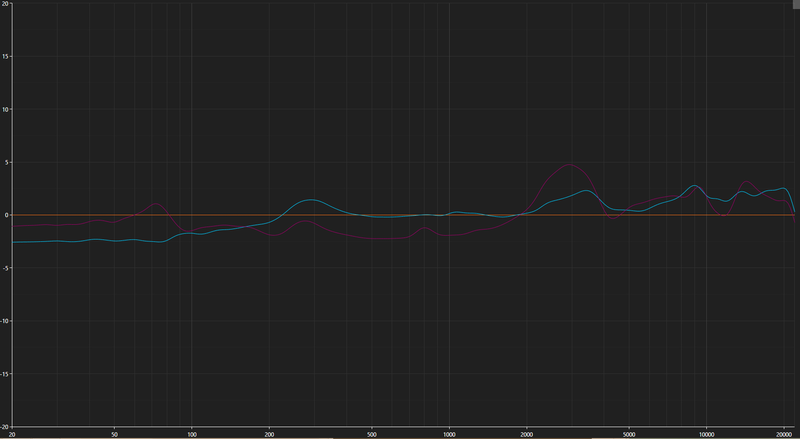 Thus, we were able to compare the calibration file created with average measurements for several MDR-7506s, which anybody can get, and the one tailored-made for our 7506s. 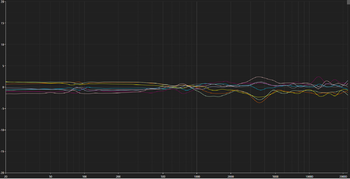 The results are pretty impressive and allowed us to realize that there can be up to 5dB(!) of difference at certain frequencies between a given pair and the average for several pairs of the same model. 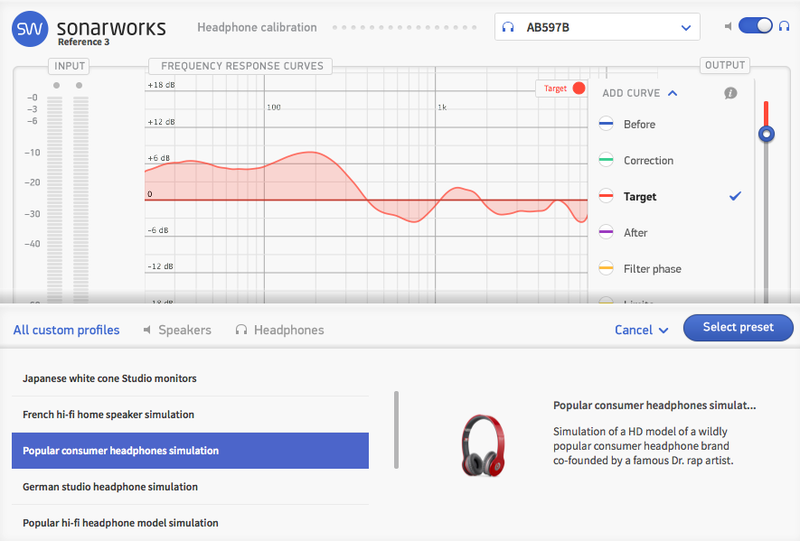 Sonarworks has nevertheless assured us that the main problems of the headphones are corrected with the average calibration profiles and that individual calibration allows you to get 5% of additional precision. The next surprise of our MDR-7506s was the asymmetry of the frequency response: they can sometimes exhibit a difference of up to 3dB between left and right channels! It's stupefying. 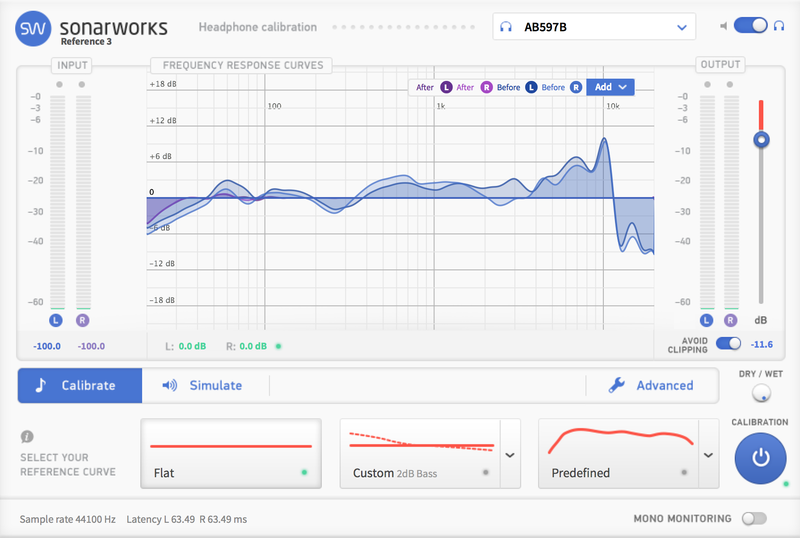 Anyway, the individual calibration solution provided by Sonarworks allows you to solve issues directly affecting your own headphones, which is pretty cool. The only thing left to do was to put it all to the test. And since the MDR-7506s are far from being our favorite cans at this price point, the experience turned out to be very interesting. Sonarworks Reference 3 is a Mac and Windows compatible plug-in available in VST, AU, RTAS, and AAX formats. 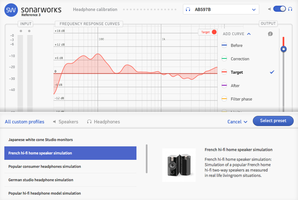 Once the plug-in window opens ─ which is the same both for speaker and headphone calibration (a switch allows you to toggle between them) ─ you can upload the calibration profile file for your headphones. 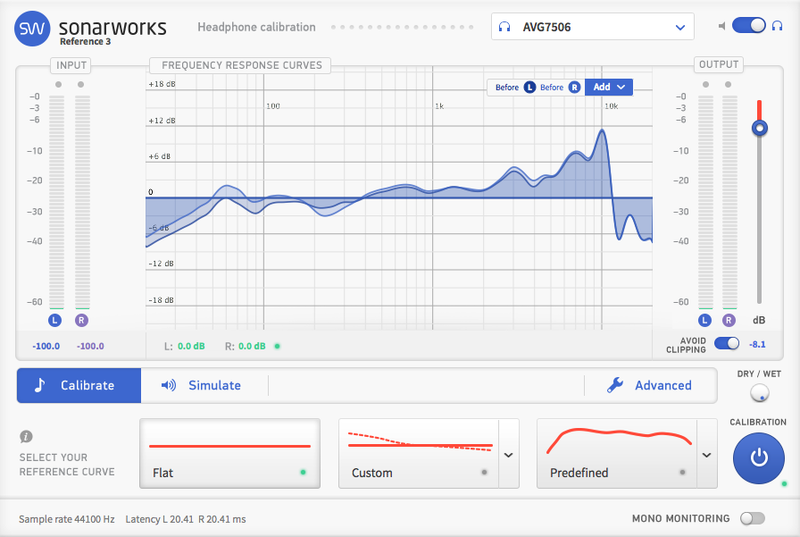 Which we did, considering that Sonarworks had sent us the profile of our MDR-7506 headphones. 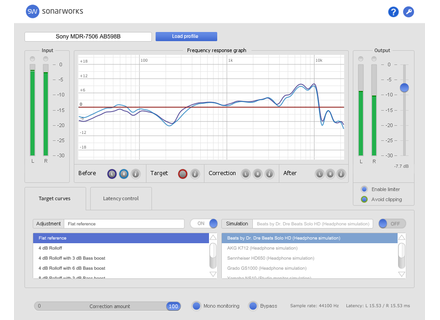 The frequency response of the left and right channels is displayed onscreen. And it's up to you decide if you wish to also have additional information displayed, like the correction applied, the targeted frequency response, the phase of the filters, and the limits of the corrections. At the bottom of the interface you can choose the desired frequency response: A completely flat response, a flat but slightly modified response (with an adjustable boost in the low end) or even "custom" profiles. This latter category includes hi-fi speakers of different sizes, based on average measurements. 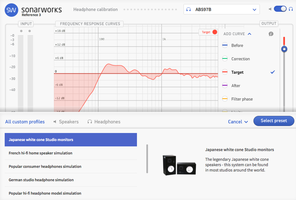 Under the Simulate tab you can find profiles based on well-known audio reproduction systems, like the Yamaha NS-10 and Focal Chorus speakers, Beats by Dre, Sennheiser HD600, and even the AKG 712 headphones. There are four slots available, so you can quickly toggle between them. Very handy. Under the Advanced menu you have access to three different filters. 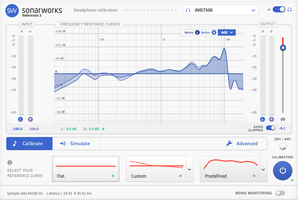 The first one leads to a minimum delay of 1.1 ms, which is great for recordings, but it is more resource-intensive and modifies the signal's phase (you can have the phase rotation displayed onscreen). The linear phase mode allows you to bypass this second problem, but with a higher latency (60 ms) and a pre-echo phenomenon in the low end, which might be a bit annoying when working with percussion instruments. Finally, the mixed mode is a compromise between the previous two: It provides a latency of 20ms and a very light phase rotation in the low end. You can also limit the correction in terms of frequency boost (+12, 6 or 0 dB), as well as at both ends of the frequency spectrum. Plus, there are a couple of switches with specific functions: One to automatically prevent digital distortion by adjusting the plug-in's output level, one to switch to mono, one to bypass the plug-in, and another one to adjust the plug-in level (dry/wet). All in all, the system seems quite comprehensive. It would be great to have more profiles based on well-known reproduction systems, though. We can only hope they will arrive with future updates. We used the plug-in within our sequencer in order to listen to personal mixes and well-known songs. We were fairly impressed by the results. 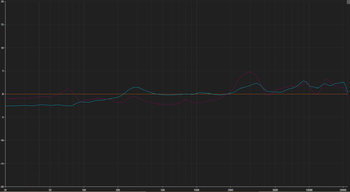 The MDR-7506s, which we don't really like, become much less aggressive and more linear at once. The result seems natural and the different options allow you to approach confidently any situation. We really like being able to switch between the profiles simulating different reproduction systems to verify the compatibility of our mixes. It's also good to know that, according to the software maker, when you select the Flat profile, the plug-in doesn't try to make the frequency response perfectly flat. What it does is that it tries to reproduce the sound of a pair of flat monitor speakers within an acoustically treated room. In order to really get immersed in the "new sound" of our headphones, we used the Audio Hijack software for Mac, which allows you to insert an AU plug-in on any audio source. Thus, we were able to use Sonarworks Reference 3 at the output of iTunes, Spotify and our browser. If you are the happy owner of a pair of headphones that has an average calibration profile from Sonarworks (however few there may be right now), we recommend that you download the 21-day demo. And remember, you can always take your frenzy a bit further by sending your headphones to Sonarworks. What Sonarworks offers is both a software application and an original service. The idea of making any pair of headphones flat and faithful is very appealing, especially for the price. And the fact that you can send in your headphones to have them measured pushes the concept even further. The result truly lives up to our expectations. If that wasn't enough, the software in itself is very comprehensive, featuring lots of parameters to allow you to handle any situation with ease. The only thing we can criticize is the small number of headphones currently available, and that the profiles based on well-known reproduction systems are a bit limited. But anyway, considering the 21-day demo version available, why not give it a try?